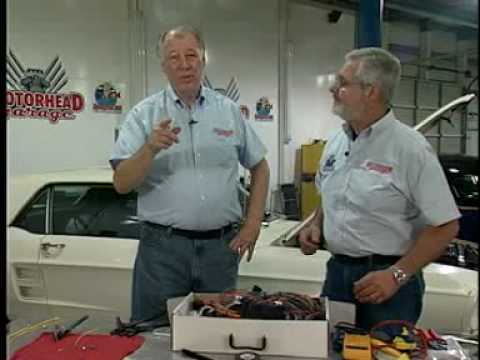 A simple test light is often all you’ll need to chase any electrical gremlins away from a classic car, but sometimes the ability to run a few more checks can be beneficial. Also, if your car is fuel injected, you want to be sure to keep the test light away from the more sensitive electronics in those systems. This is where a digital multimeter can come in handy, but it’s important to know what type of test to run for a given situation. One of the most frequently misunderstood tests is a continuity check. Many multimeters have a continuity setting, usually represented by a position marked with a symbol that looks like a sound wave. A digital multimeter in the “continuity check” setting. Continuity simply means a circuit is electrically connected, so a continuity check can help you determine if you have a blown fuse or broken wire. The most important thing to know when checking a circuit for continuity is to make sure it does not have power during your check. This means the battery should be disconnected, or the wire otherwise isolated from power. Meters with this setting will beep when their test leads are connected together, or are placed at opposite ends of a wire that has continuity. A meter that shows “1” or “OL” does not have continuity. This would point to the broken wire or blown fuse mentioned above. Once an “open” circuit like this has been found, you can begin inspection of the harness and connectors to find the source of the problem. If you find two circuits that should not have continuity are connected, it means you have a short in your harness, and can once begin exploring to determine the problem area.